Legendary Cincinnati Star Pete Rose is scheduled to speak for the WVU baseball team’s Leadoff Dinner that is happening on Saturday, January 30 in Morgantown, West Virginia. The event will take place at the Morgantown Event Center and will begin at 4 p.m. with a reception and and finish after Rose speaks at 6 p.m.. Tickets to the dinner will cost $100 for each individual person, or $500 for a VIP seat. In addition to that, VIP sponsorship tables can be reserved for $1.000. For those who purchase a VIP individual ticket, they will be given a photo opportunity with Rose. Proceeds from the banquet, ticket sales, and a silent auction will benefit the Mountaineer baseball program. The Cincinnati native went to Western Hills High School where he was encouraged to participate in sports by his parents. Due to a lack of success in football, Rose lost control of his studies and ended up having to repeat an academic year, but got involved in baseball. Thanks to his uncle Buddy Bloebaum, who was a scout for the Cincinnati Reds, he was given a chance to be given a closer look at by the team management. At the time, the Reds had lost a lot of good players who were merely prospects before, so they took a chance on Rose and couldn’t have been happier with that decision. 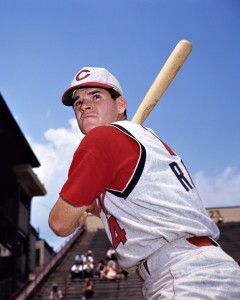 Rose did two career stints with the Reds, one from 1963-1978, and another shortly before he retired as a player from 1984-1986. During his career he also played with the Philadelphia Phillies. After hanging up his baseball bat, Rose was the manager of the Reds for five years until 1989 too. The three-time World Series champion is going to be speaking at the WVU dinner banquet event that is happening later on this month. It is expected to draw in lots of fans and contributors, as Rose will end the night with his talk. If your company is interested in finding out availability and booking fees for a former professional baseball player like Pete Rose or other sports celebrities for a Keynote Speech, Autograph Signing, Guest Appearance, or Baseball Camp, call us at 1-888-246-7141.